Birthday Painting information at the end of this entry. This Dave Brubeck a painting I started in February and finished in early May has finally found its way to ah home. 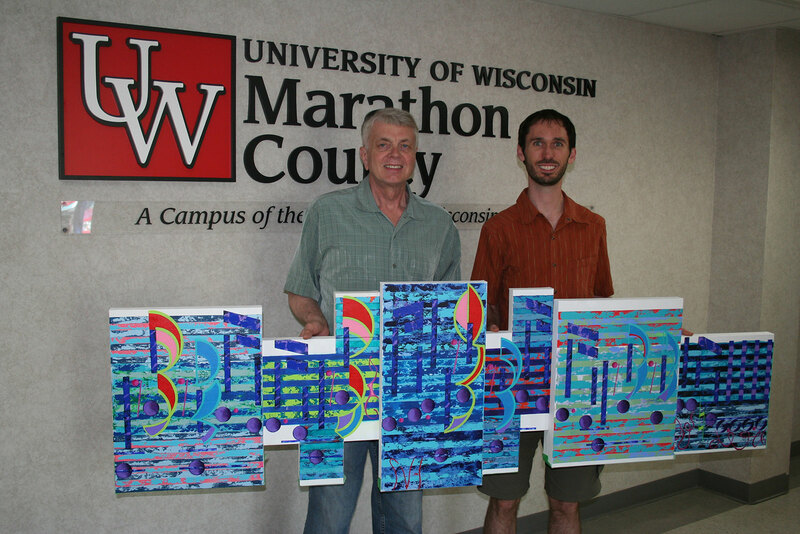 I presented this most wonderful artwork to Timothy Buchholz, my Music Theory teacher and the assistant Professor of Music at the University of Wisconsin Marathon Campus. This is a long story that started with me taking Professor Buchholz’s Music Theory class the fall semester in 2012. This was my first return to the University of Wisconsin system since I graduated with a Degree in Business Administration back in the Disco summer days of 1971. I first met the Professor when I stopped by his office to see if he would allow me to audit his Theory class. I actually studied for this meeting, and it came in handy when he asked me a couple of music questions. I never missed a class, and took all the tests. I ended up with an A and was tie for the highest score on the Final exam. But more important I learned I could still learn, and I meet one wonderful and dedicated Teacher. I took his class to get a better understanding of the theory behind music. Though out my life I have enjoyed taking things a part to see how they work. Well that class gave me a great start to understanding the fundamentals of the language that is music. When I finished his course late December I wanted to thank the Professor Buchholz for the wonderful experience I had being part of his Music Theory class. I decided that the best way to show my appreciation was to paint a picture and present it to the music department. I asked for his music suggestions, and he came up quickly with Dave Brubeck. Well it was not until the late spring of this year that I was able to hand over this new version of Take Five. The simple reason, even though this second painting is smaller than my first attempt, was that Professor Buchhloz could not find an appropriate space big enough to hang the artwork. That changed this spring with the start of the remodeling of his Orchestra room. He said I would be invited back in the fall to see Take Five hung in place. He also mentioned that they would use colors from the painting to decorate the room, including taking a blue from the painting for the color of the drapes. Wow, how cool is that having an entire large room in harmony with Take Five. ON THIS COMING THURSDAY, JULY 31ST I WILL BE PAINTING MY BIRTHDAY PAINTING. FOR THE NEXT THREE DAYS YOU WILL HAVE THE OPPORTUNITY TO BID ON THAT ARTWORK. MORE DETAILS TO COME.